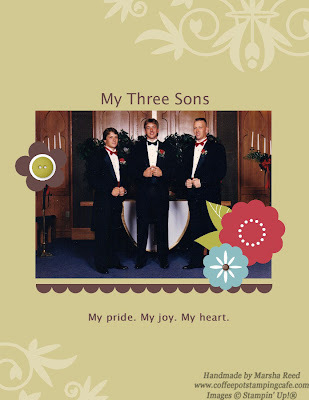 Three of the most important things in my life are my wonderful and handsome sons. This picture was taken many years ago, but I just had to show them off in their tuxedos. With their busy lives, I don't get to spend as much time with them as I would like but I am so thankful that the good Lord allowed me to be their mother. I used one the of Designer Templates available in My Digital Studio. I changed the background to River Rock but have yet to learn how to change the colors on the embellishments. Little by little I'm getting the hang of it. My oldest son will be home next week and I am so looking forward to seeing him again. It has been over a year since I last saw him. If all goes according to plan, he will be bringing his two sons with him. I can't wait to see them! I hope to have a new picture of my three together along with bunches of others with my grandsons. I'm so excited!